A common myth that circulates around many Thanksgiving holiday dinner tables is that the turkey you eat, which is rich in tryptophan, makes you sleepy. Although often repeated, it isn’t true. Yes, tryptophan is an amino acid found in turkey. And yes, it can be converted into the brain chemicals serotonin, which is associated with mood, memory and learning, and melatonin, which plays an important role in the sleep–wake cycle. But despite the popularity of the turkey-tryptophan-tiredness myth, research has shown that turkey has no more tryptophan than other common meats like chicken and beef. Other foods, such as nuts and cheese, contain more tryptophan than turkey. What does tryptophan have to do with pet nutrition? Many dog and cat owners focus on the amount and source of the protein in their pets’ food. While your pets need a certain level of protein in their diets to be healthy, it’s really the amino acids that make up those proteins that your pets require. Amino acids are the building blocks of all proteins. Think of protein as a bead necklace, with each bead being an amino acid. It’s the type of beads and the order in which they’re arranged that makes each protein unique and determines its role in the body. 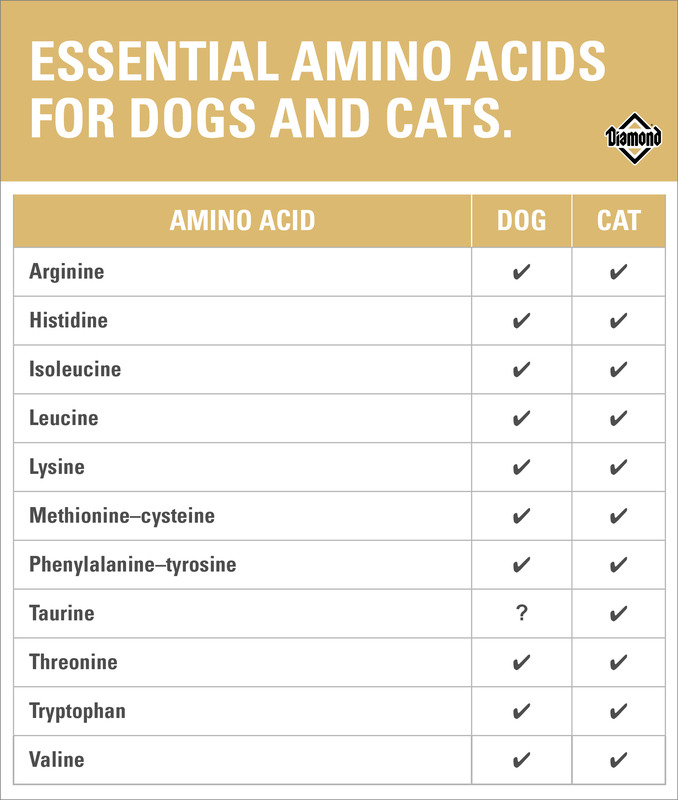 Dogs and cats use 20 different amino acids to make the various proteins that their bodies need. Some amino acids are considered essential, meaning they must be obtained from food because the body cannot make them or can’t make enough of them by itself to stay healthy. 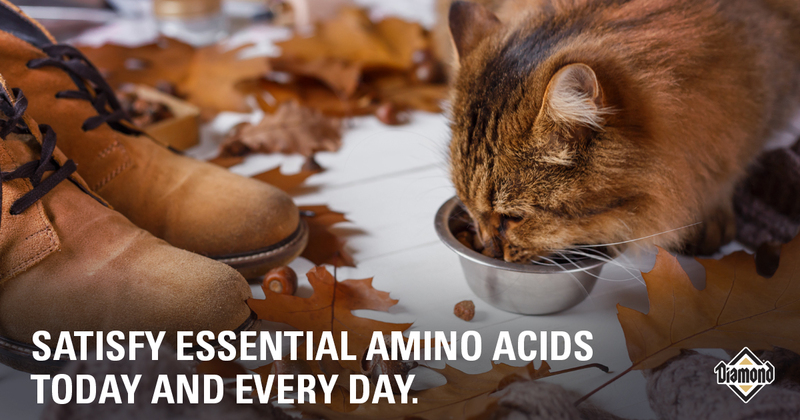 Tryptophan is one of 10 essential amino acids for dogs and one of 11 essential amino acids for cats. As for the nonessential amino acids found in food proteins, those are used by the body to make new proteins as they’re needed. Nonessential amino acids can also be broken down further to make glucose (blood sugar) and used for energy to maintain body functions or to fuel growth, pregnancy and nursing. What happens if a pet’s food doesn’t provide all the essential amino acids? Protein chains are made by cells in a step-by-step fashion. If just one essential amino acid is missing, that specific protein-making process shuts down. Substitutions aren’t allowed. And if the lack of an essential amino acid goes on long enough, the body will break down its own tissues to provide the required amino acids — and that compromises health. Nutritionists, including veterinary nutritionists, gauge protein quality by its digestibility and essential amino acid content. Many essential amino acids are present in proteins from both plant and animal sources. However, taurine is only found in meat proteins. And since taurine is an essential amino acid for cats, cat foods must contain meat protein. For some dogs, taurine is considered conditionally essential, meaning that it is only required in specific situations or by certain breeds. This Thanksgiving, you and your pets can be thankful for complete and balanced dog and cat foods, such as the Diamond, Diamond Naturals and Diamond Naturals Grain-Free formulas. To be labeled “complete and balanced,” a pet food must provide all of the currently known essential nutrients (except water) in the correct amounts and ratios to meet pets’ daily needs. The beef, chicken, salmon, lamb and other protein-containing ingredients used to make Diamond pet foods are specifically formulated to provide all of the essential amino acids dogs and cats require. So whether you enjoy turkey or tofurkey during your Thanksgiving Day feast, rest assured that either dish provides you with all nine essential amino acids that you need to help your body meet its essential amino acid requirements — and Diamond pet foods are meeting your dog’s and cat’s needs.